The still-scorched branches of the forest served as perfectly awful camouflage for the near-unrecognizable former leader of ThunderClan. Dark fur barely hid her nearly non-existent belly and protruding ribs. The weak Leafbare sun was a cruel mother to the territories, smothering the Clans for one season and abandoning them the next. Darkflight's eyes could have once been described as sun-like, in her younger years, full of life and youth. They were dead now. Her gaze was blank as she stared out through the tops of the trees, feeling as if her mind and body were fully separated. Her mind did not register the fierce chill of the breeze cutting though her rough, ungroomed mass of fur, nor the crying of her stomach for food that they didn't have. She might as well be a corpse. 'This is my fault.' Her children, cats she had birthed and loved with all her heart, had either ended up leaving her for StarClan far too early, or betraying the clan she loved. Dear Rockthorn and Bramblefrost, cats she had called her sons, but never acted like a mother towards. What could she have done to prevent their treachery? It was her own fault for being so bling towards their actions, to allow them to hurt her clan so. But, deep in her heart, she found that she still loved them. It hurt to know that her children's names would only be known for the nasty shadows they had left upon their death. Specklefang, she could have helped her too, the spitting image of Specklefur. She should have been a better leader, a better grandmother. And the rest of her kin, she didn't know who they were anymore. She hoped to be forgotten, to just be the strange, old she-cat with only three legs. Otherwise, it would be only a matter of time before she ruined them too. Her blank gaze hovered in the air between her and the thick blanket of clouds. The snow of yesterday had melted, but refroze, making the clan and its territories all the more miserable. How long had she been in this tree? Hours? Days? Weeks? The clouds did not reply. She felt the scarred branch begin to creak and rain bits of wet soot onto the frozen mud below. She didn't show any outward signs of moving. So what if it crumbled beneath her paws? So what if she fell? She had no use in this clan anymore. Her decisions as a leader had wrought unforeseen consequences upon her Clanmates. She had done so much more harm than good. Perhaps it was just her head telling her this. That RiverClan warrior had damaged something deep within her brain and left the rest of her confused and uncoordinated. Who was he? She couldn't remember, just as much as the names of her younger Clanmates kept slipping from her mind. Sometimes, sometimes, oh too many times she awoke and expected to still be inside the Highrock, alone. She expected to see young Rockthorn sleeping beside her as he had always done, before he broke. Before she failed him. She expected to see Bramblefrost leading the apprentice-aged Lionspark out of camp for training, and for Bluesong and Cloverpool to be spreading out in the Greenleaf sun. Oh-so-young Leopardclaw and Lichenfang sharing tongues beneath the shade of the sprawling oak tree that once stretched over ThunderClan camp. And... Jaggedfeather, her mate, when both of them showed no grey fur nor weary limbs, nonchalantly waiting for her to awaken and to join him on a patrol; then-Blizzardshine practically trying to drag him out of camp as he was holding them back. Where had those times gone? The nostalgia hurt her heart. Oh, had she taken for granted the ability to speak with StarClan, to communicate to those that they had lost! She would give anything to speak with her mother now, nor her father, or her brother, or any of her children! Her claws sank into the wood as her whole body trembled. Her fur stood on end as she shook and curled in on herself. Why couldn't she have died so long ago and known only the happy days, not these agonizing few moons of Leafbare! She could feel her death approaching, not now, but soon. She didn't know if what she felt for it was apprehension or longing. While her thoughts were an ever-growing maelstrom, everything around her was eerily silent. Perhaps, if she were to die here, she wouldn't have be any more of a burden to her clan. They were no longer her family. They would have been stronger if she hadn't been their neglectful mother, whose bright eyes were now only dead suns. Blizzardstar stepped out of her warm den with a soft sigh. Her paws felt weak, and while her long fluffy coat kept her warm and protected against the snow, deep inside she felt so cold…so empty. 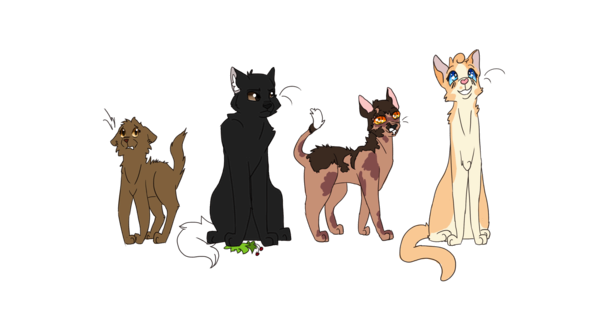 Not a single day passed since the visit of the RiverClan leader that she didn’t hope to wake up and step out of her den to find the big brown figure of Specklefang bickering with her clanmates, or the energetic young Flickerpaw playing around with the rest of the apprentices before going out in a patrol. That it was nothing but a nightmare. But each time she woke, the absence of her two clanmates made her feel like something was missing, guilty even. She knew that murder was beyond unacceptable…but was she any better after agreeing to give away Flickerpaw to a life of permanent regret and aid in the murder of Specklefang? It might had been the price to pay for peace, to contempt the wrath of the aggressive RiverClan leader…but it was the right thing to do at all? Her eyes, once bright and full of life and now as cold as the ice they shared their color with, scanned the camp. Her clanmates kept going on with their routines, something she couldn’t help but admire. Had she seriously wrong so weak that she couldn’t fulfil the duties that as a leader she was supposed to be doing? Was her clan grown stronger while she didn’t? A mix of both? Her thought process, however, stopped abruptly as she looked at Darkflight, the dark warrior who she once called leader. She may had given up the spot, but she still respected her a such and watching her fall into the ominous abyss of her depression only made her heart feel heavy. However, instead of walking away she shook her head and the first determined expression she had in moons made itself clear in her face. She had stood on the sides of this for way too long. Her friend needed her. She wasn’t going to sit and watch anymore. Due to a mix of college and work, my free time is not exactly great and that causes me to potentially be extremely active one day and completely missing the other. I'll try my best to post as often as I can, but if you urgently need me somewhere, your best bet is to either ping me in the Discord WCC chat or send me a PM through there. The elderly she-cat did not realize her leader was beside her for several heartbeats. Her eyes remained dull and lifeless as she continued to dissociate, staring into the middle ground. It was only after she noticed the cold breeze had been replaced with... warmth. Darkflight turned her head slightly, confused. 'Blizzardshine? No, Blizzardstar.' The white she-cat's words took almost too long for her to register and understand. She curled her paws under her chest, making her appear even smaller. It took even longer for her to formulate a response. It was so difficult to describe to someone who had never been a mother. Or to any cat for that matter, for surely no mother in the history of the forest had ever dealt with as much as she. She prayed to StarClan no she-cat had to suffer as much. Surely not even her own mother felt this agony. It was as if she started mid-thought. "Having children is not for the faint of heart, Blizzardstar. I wish I had known that." The dark-furred warrior took a shuddering breath, which ended in a wet cough. Uncleaned claws sunk into the pads of her paws. The pain briefly grounded her in the moment, though not for long. Her voice came quiet, but it shook like a drenched kitten, "I should have known better, I should have done better...!" Blizzardstar didn’t mind to wait for her friend to answer. A lot was going through her own mind thanks to how harsh times had been lately and she guessed that something similar was going on with Darkflight, even she had trouble to put her thoughts together into a comprehensible phrase instead of allowing words to come out of her muzzle in tangled sentences driven by her emotions lately. She would be lying if she said that what she heard coming from Darkflight’s muzzle was what she expected. She looked away for a second, allowing her mind to wander off. She remembered both the biological and adopted children on Darkflight and he pieces started to slowly but surely fall into place. The kits who were taken far too early from the side of the grieving mother, the few that survived and grew up to warriors…only to become traitors and murderers in one way or another. She probably wouldn’t be able to understand what Darkflight was going through at the time, as she didn’t have kits of her own and, if she ever had, she hoped thy wouldn’t walk down such paths…but at least she felt she had some partial clarity o the matter. Since her leader ceremony, and more specifically since her mother gave her first life in StarClan, she had grown to love her clan like a mother loves her kits, celebrate their successes, comfort them in their failures…grief their deaths and even grew a bit blind to the mistakes they committed out of such strong love. Her long tail moved to lay on the dark warrior’s back in a comforting manner as she did her best to find words that could aid her on helping Darkflight. She wish she had the knowledge and experience needed to help a mother like her go through this…but she didn’t, and acting like she did could only bring further pain and worsen the situation on the long run. “I may not be able to talk as a mother…” Her voice was low as her eyes fell on the depressed figure of her friend, seeking the once cheerful golden gaze n her face that she missed so much, even if she knew she probably wouldn’t find it “…but as a leader with many cats I came to love as closely as possible to one, I can tell you that nothing can prepare us for this. And as much as we may wish it, of how much we try to protect them, we can’t control the fate of those we see as family, their choices aren’t ours to make…”. As she spoke, her own gaze drifted to the clan before them as they kept working, kept choosing, kept living “The most we can do is to prepare them as much as possible, try our best to keep the in the right path. I know how hard you tried to do that, Darkflight, I was there to see it…but there are so many variables we can’t control, so many roads they can walk. The choices they made, regardless of what led to them, are most likely not your fault”.